[#166 Washington St.] On the corner of the Guild Block building, the faded sign of the previous owner of the grocery store, Francis H. Bacon, is still visible to the right. 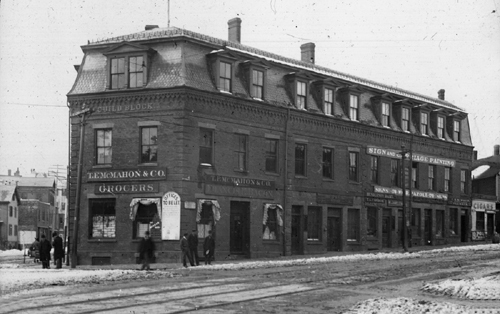 Thomas F. McMahon, who had been a clerk in Bacon’s store, took over the business when Bacon died in 1898. [#172 Washington St.] Henderson Dairy and T. A. Conroy, Gas and Electric Fixtures. [#176 Washington St.] George P. Johnson Fish Co.